value, active power, accumulated electric quantity, grid frequency and power factor in full screen, and can be widely used in civil and industrial fields. 1.The sum of load power of the electric appliance connected with the product should not exceed rated power, or the product will be damaged, even resulting in fires. 2.The product doesn't have waterproof function, so please use it under dry environment. Prevent splash water when using it near a bathroom, a kitchen, a fishbowl, etc. Keep it away from children and fire; do not plug any foreign matter rather than a wire in the connection hole; please fasten the screw. 3.Do not disassemble the product without permission. Please allow 1-3cm differs due to manual measurement. Due to the different display and different light, the picture may not reflect the actual color of the item. Thanks for your understanding. 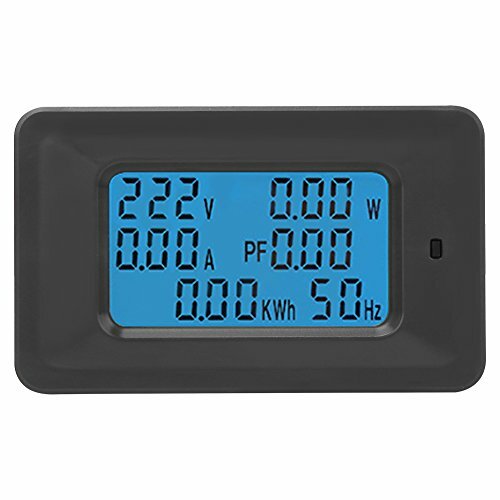 Can be connected with the test of eletrical power, voltage, current and so on. Backlight control, short press to turn on/off backlight. Clear energy reading, press and hold down the key to clear the reading of kWh.